Preparation of parenteral medication in hospitals is a complex process with a risk of microbial contamination of the product, especially when inappropriately prepared. Contaminated parenteral medications can cause severe complications to patients and increase morbidity in hospitals. The aim of this literature review is to systematically evaluate the contamination rate of parenteral medications in hospitals prepared in a pharmacy environment and a clinical environment. A literature search of PubMed and EMBASE from 2000 to 2018 was performed. Two different environments where preparation may be carried out were defined. Point estimates and 95% confidence intervals for contamination rates were calculated for each environment of medication preparation. The meta-analysis was performed using a random effects model. The contamination rates in the clinical environment (n = 13 studies) varied between 1.09 and 20.70%. In the pharmacy environment (n = 5), all contamination rates were 0.00% except for one study (0.66%). 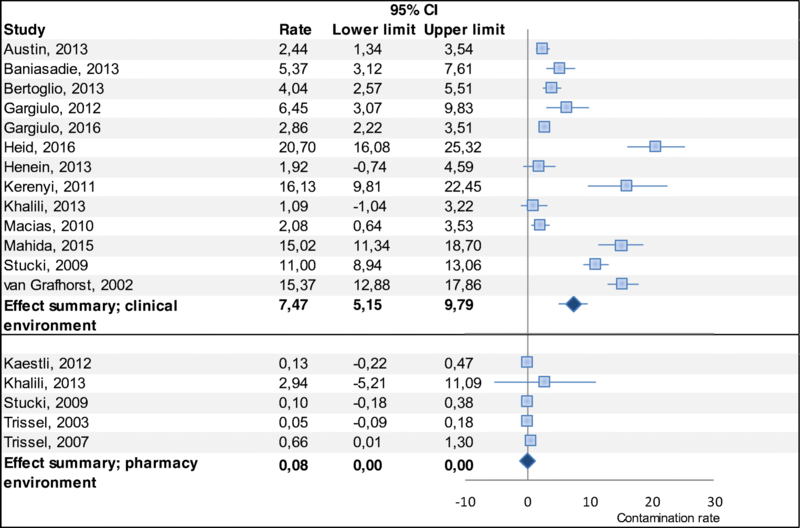 The point estimates (random effect model) for the overall contamination rate of doses prepared in the clinical environment was 7.47% (5.16–9.79%), and 0.08% for doses prepared in the pharmacy environment. The point estimates (random effect model) for the overall contamination rate of doses prepared by nursing/ medical staff was 7.85% (5.18–10.53%), and 0.08% for doses prepared by pharmacy staff. Significantly higher contamination rates were found for the preparation of parenteral medication in the clinical environment compared to pharmacy environment. In accordance with recent guidance, the almost 100-fold higher changes of contamination when reconstitution is performed in the clinical environment should urge hospitals to review their reconstitution process and apply risk-reducing measures to improve patient safety of parenteral therapy. The online version of this article ( https://doi.org/10.1007/s00228-019-02631-2) contains supplementary material, which is available to authorized users. Healthcare-associated infections are an important cause of morbidity and mortality in hospitals all over the world . Parenteral administration of (liquid) medications bears the risk of nosocomial infections [2, 3, 4]. One of the sources of infections can be contaminated parenteral products [5, 6]. Contamination may occur at any step in the process from manufacturing in industry or pharmacy to administration to patients in the ward environment. Many parenteral products require preparation steps including reconstitution of the medication prior to administration. The highest contamination risks have been associated with these preparation steps in the hospital environment . There are numerous case reports of outbreaks [8, 9, 10, 11]. This review will focus on the difference in contamination risk of the reconstitution of parenteral medications between clinical and pharmacy environment. Parenteral products can be reconstituted in the pharmacy department (pharmacy environment) or in the clinical environment such as hospital wards. In Europe, medication preparation in the pharmacy department is performed according to good manufacturing practice (GMP) guidelines or the recently adopted resolution CM/Res AP (2011) on quality and safety assurance requirements for medicinal products prepared in pharmacies with a special paragraph about reconstitution [12, 13]. For preparations on the wards, a general European guideline has been published recently, but has not been evaluated in studies . Furthermore, several countries have published national guidelines, such as the Dutch Hospital Patient Safety Program or the epic-3 guideline for the UK [15, 16]. In a meta-analysis, Austin et al. found a contamination rate of 3.7% for the clinical environment and 0.5% for the pharmacy environment . Austin et al. included 34 studies, but 22 (65%) of those were published before 2000. Due to new guidelines, and a potentially changed working environment and infrastructure in hospitals over the past 18 years an update of this systematic review is needed to reflect current practice [15, 16, 18, 19]. 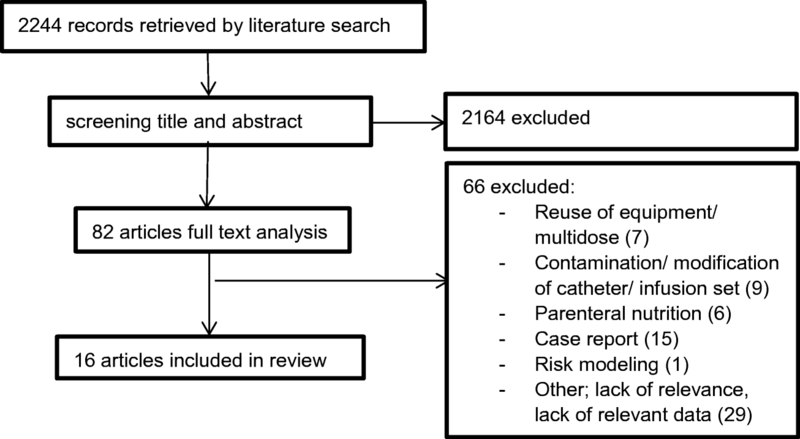 This systematic review aims to establish and compare the contamination rate of parenteral medications prepared in a clinical environment and a pharmacy environment. We followed the preferred reporting items for systematic reviews and meta-analyses (PRISMA) statement in reporting results of this systematic review . The literature search was conducted on 26 October 2018 in PubMed and EMBASE. We used the Emtree terms “intravenous drug administration” (including synonyms), “syringes,” ‘infusion’ in combination with “contamination” or ‘fungal contamination.” All search terms were also used as free search terms mentioned in the abstract or title of the study. An example of the search strategy is added as Appendix. All original studies assessing contamination in relation to the preparation of medication in the hospital setting were included. The preparation of the medication includes all necessary steps/manipulations needed to enable the use or administration of parenteral medication, e.g., the reconstitution of a parenteral medication product . Studies had to report a contamination rate or contaminated subjects as outcome. Case reports or studies about surface contamination, cytotoxic drugs, and parenteral nutrition or lipid emulsions were excluded. Those preparations were excluded as most hospitals operate separate procedures due to the toxic nature of cytotoxics and the high susceptibility of contamination and bacterial growth of parenteral nutrition and lipid emulsions. Studies which only assessed multidose vials or ampoules or infusion bags that were used more than once were also excluded because they are intrinsically more susceptible for contamination. The search was limited to publications in English. Furthermore, the search was limited to recent studies, because improvements have been carried out over the past decades concerning infection control and hygiene in the hospital setting [15, 16, 18, 19]. Studies published between January 2000 and October 2018 were included in the analysis. Two reviewers screened the titles and abstracts of the retrieved records, independently . Full texts of all potentially eligible records were also examined independently by the two reviewers. Disagreements were resolved by consensus. The following data were extracted using an Excel spreadsheet: first author, publication year, country, sample tested, method of contamination testing, environment of preparation, type of personnel who performed the preparation, number of simulations/preparations, and number of contaminated containers/contamination rate. The included studies were firstly categorized by environment where the preparation was performed; pharmacy (controlled environment, e.g., cleanroom, laminar airflow hood (LAF)) versus clinical environment. The clinical environment includes patient care areas like the operating room, intensive care unit, and general wards. And secondly, by the personnel who performed the preparation: pharmaceutical personnel versus nursing/medical staff. For each study, the number of microbially contaminated and not contaminated doses was extracted. Point estimates and 95% confidence intervals for contamination rates were calculated for each group. Unpaired t test was used in the analysis. The meta-analysis was undertaken using a random effects model . When zero rates of contamination were reported in the studies, meta-analysis was performed using a value of 0.5 contamination in the study to overcome the mathematical difficulties associated with logarithmic transformation. The random effects model was chosen because of the variability of sample characteristics, intervention, and comparison conditions. Heterogeneity of the studies was assessed using I2 test. A p value of < 0.05 was considered to be statistically significant. Data analysis was done in Microsoft Excel . Initially, a total of 2244 studies were identified for inclusion in the systematic review. After screening of title and abstract, 2164 articles were discarded, because they did not meet the selection criteria. The full text of the 82 remaining articles was reviewed in more detail. Finally, sixteen articles were included in the systematic review (Fig. 1) [8, 23, 24, 25, 26, 27, 28, 29, 30, 31, 32, 33, 34, 35, 36, 37]. All studies were performed between 1999 and 2016. The main characteristics of the included studies are summarized in Table 1. 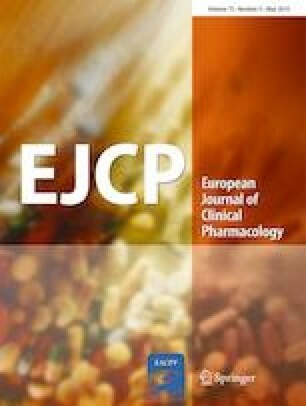 Three studies compared directly the preparation of syringes in different environments: clinical versus pharmacy (controlled) environment [28, 33, 35]. Ten studies were performed in a clinical environment (general ward, operating room, or intensive care unit) [8, 23, 24, 25, 26, 27, 29, 30, 32, 34] and three studies were performed in a pharmacy environment) [31, 36, 37]. Isolates from the syringes were compared with those cultured from blood patients from same patient. Supernatant of flushed syringe was inoculated on a blood agar plate. Six studies used a direct medium filled simulation technique for assessing microbial contamination [23, 28, 31, 35, 36, 37]. Eight studies examined microbial growth by an indirect method taking samples from used vials, infusion bags, or syringes [8, 24, 30, 32, 33, 34]. In two studies, the simulation was performed using filter membrane units which were cultured after use [26, 27]. Fifteen studies used a defined growth medium and incubation time and period to assess microbial growth. Microbial contamination was assessed using visual inspection (turbidity). Only the study of Bertoglio et al. used frequency of reported infection rate as primary outcome instead of microbial contamination of the used syringes . Seven studies made a further examination of the microbial contamination with gram staining and or identification of the microorganism [8, 24, 26, 28, 29, 32, 34]. In the clinical environment, contamination rates varied between 1.09 and 20.70%. In the pharmacy environment, all contamination rates were 0.00% except for the study of Trissel et al., they found a contamination rate of 0.66% (Fig. 2). 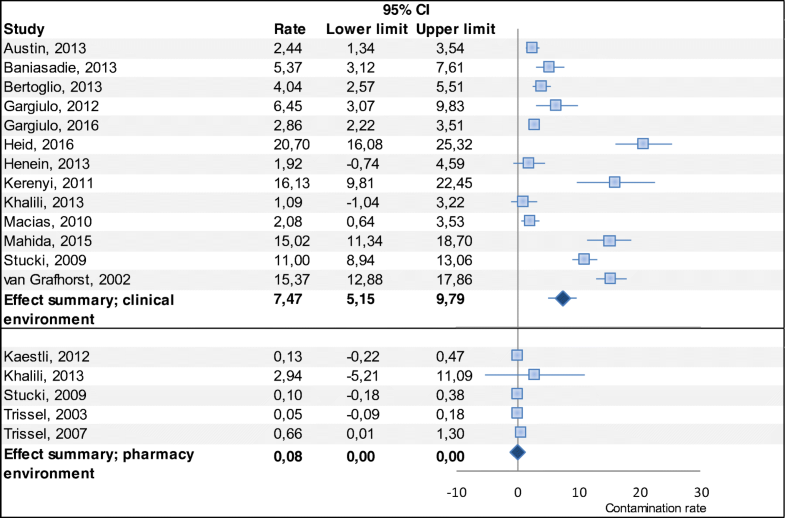 The point estimates (random effect model) for the overall contamination rate of doses prepared in the clinical environment was 7.47% (5.16–9.79%), and 0.08% for doses prepared in the pharmacy environment (Fig. 2). The calculated overall contamination rate for the pharmacy environment was different from the individual contamination rates of the included studies, because we had to assume a 0.5 contamination rate for studies were no contamination was found (see Method section) [31, 33, 35, 36]. This had a major impact to the study of Khalili et al. due to the small sample size (n = 17) . The contamination rates of doses prepared in a clinical environment were higher and more variable than those prepared in a pharmacy environment. The heterogeneity of the studies, expressed as I2 reflected this. I2 was 96% for the clinical environment and 0.0% for the pharmacy environment. Only two studies examined both environments and found lower contamination rates for the pharmacy environment [33, 35]. All other studies examined only one environment. Similar results were obtained in the second analysis by type of personnel who performed the preparation of the doses. The point estimates (random effect model) for the overall contamination rate of doses prepared by nursing/medical staff was 7.85% (5.18–10.53%), and 0.08% for doses prepared by pharmacy staff (Fig. 3). Our meta-analysis showed that about 1 in 13 parenteral products prepared in a clinical environment were contaminated versus about 1 in 1250 prepared in a pharmacy environment. Similar results were obtained for nursing/medical staff versus pharmacy staff. Remarkably, the systematic review by Austin et al., taking into account studies dating back to the 1970s of the last century found a lower contamination rate in the clinical environment. This is surprising, given the attention, parenteral preparations had in recent years and the availability of guidelines for procedures in clinical environment [12, 14, 15]. High workload of nursing staff may play a role. For example, it has been shown that disruptions during the reconstitution affect aseptic technique [38, 39]. Also, the preparation and administration of parenteral medication is a multi-step process which is time consuming when performed properly . The observed increase in contamination could also be due to the fact that currently more products are being supplied as ready-to-use or ready to administer, having a deskilling effect on the staff on a ward [14, 18]. 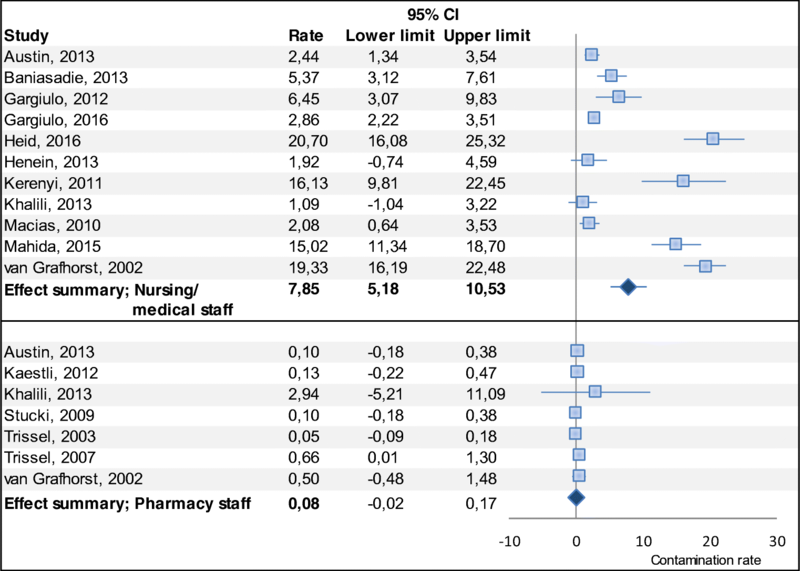 Austin et al., found a slightly higher contamination rate for the pharmacy environment . This trend is reassuring and may be the effect of the more stringent guidelines and stricter adherence to microbial monitoring in clean room areas nowadays [12, 14]. In most of the studies, the type of environment determined the type of staff carrying out the preparation. Methodologically, it is therefore difficult to distinguish between the effects of the environment and the type of staff on the contamination rate. A few studies suggest that personnel has a major impact. The studies by Grafhorst et al. and Austin et al. found a zero contamination rate when pharmacy staff prepared medication in a clinical environment [23, 28]. Also, the study by Thomas et al. suggested that the type of staff is probably by far the most deterministic factor determining contamination rate. In the study of Thomas et al., no significant difference in the microbial growth of products were seen; any environmental considerations were overshadowed by the importance of the operator’s aseptic technique [23, 28, 41]. This may also be the reason for the higher contamination rates seen in the clinical environment in our results. Good aseptic technique includes hand hygiene, disinfecting the preparation area, and vials. Some studies showed low adherence to aseptic technique by medical staff in healthcare establishments [38, 42, 43, 44]. Pharmacy staff receives extensive training on aseptic techniques and their skills are validated regularly [12, 13]. There are considerable differences in the environment on the ward compared to the pharmacy department. Nowadays, preparation areas in the pharmacy department are highly controlled and require an appropriate environmental cleanliness level to minimize the risks of particulate or microbial contamination . In contrast, by and large, clinical environments lack most of those features which increases the risk for microbial contamination of the preparation [12, 14]. We lack large, well-conducted studies linking contamination rates of parenteral products with patient outcomes between different environments. Case reports have shown high morbidity and mortality caused by contaminated medications [8, 9, 10, 45]. Given the high costs of hospital-acquired infections [46, 47, 48, 49], the high contamination rate associated with parenteral products prepared in clinical environment seems unacceptable. In the USA, the majority of intravenous doses are prepared in the pharmacy department while in European hospitals, parenteral medication are mostly prepared in near-patient areas due to insufficient resources . As already mentioned, different guidelines exists for preparation of parenteral products in clinical environment across Europe. But also to pharmacy preparations differences exists in practice and legislation across Europe . Recently, the Committee of Ministers of the Council of Europe passed a Resolution CM/Res(2016)2 on good reconstitution practices in healthcare establishments for medicinal products for parenteral use . This resolution provides a risk assessment for the reconstitution of medicinal products which can help healthcare institutions to decide which products should be reconstituted in the pharmacy and which products may be safely reconstituted in clinical environment with appropriate risk-reducing measures, like training and standard operating procedures . It also outlines the need to document the qualification and competence (continuous education, maintaining competence, regular training) of medical staff performing preparations in clinical environment. Particularly important are knowledge and skills in calculation, awareness about hygiene and microbiology, and training in aseptic handling to prevent errors during the preparation of medication [14, 52, 53]. Another strategy to reduce the contamination rate is the use of ready to use or ready to administer (RTU/RTA) medication prepared by the pharmacy or industry as recommended by the Joint Commission International standard . This systematic review has a number of limitations which need to be considered. First, only two databases were used for the literature search as we expected that these databases contained the relevant literature. We also did not carry out a formal search of gray literature. All references of the included studies were reviewed but no new studies were found. Second, the diversity of the included studies. The included studies used different methods of sampling, different simulation methods and even within one environment (either clinical or pharmacy) studies were performed at truly different conditions. Not only clinical environment and pharmacy environment, but also in different clinical environments, e.g., operating room, intensive care unit, and general ward. This is also shown in the heterogeneity of the results of the studies about contamination rate in the clinical environment (I2 = 96%). Further, subgroup analysis could not be performed due to small subgroups. Although the I2 is very high, the clinical implications of the observed degree of inconsistency across included studies should be considered . All estimates of the individual studies show more or less the same direction of effect. Austin et al. found a similar heterogeneity . Due to the heterogeneity of the methods of the studies, we did not perform a detailed assessment of the quality of the studies. Also currently available instruments were not suitable for the studies included in our review . Third, all included studies used microbial contamination as endpoint. But, the method of determining contamination varied between the studies. Different methods of sampling were used, different growth media were used, and incubation time and incubation temperature of agar plates syringes were not identical which could lead to different outcomes. Further, not all studies characterized the microorganism in contaminated products. Future studies should apply standard procedures with minor manipulations to obtain samples following established standards in testing samples (European Pharmacopeia or United States Pharmacopeia (USP)). Finally, more work needs to be done to address the clinical implications of contaminated medications. This is an important aspect of patient safety of parenteral products and it should be aligned with other initiatives such as good prescribing , safe labelling , and technologies to improve the administration of medications, for example, a bar-code administration system [58, 59]. Significantly higher contamination rates were found for the preparation of parenteral medications in the clinical environment compared to pharmacy environment. In accordance with the recent guidance, hospitals should review the reconstitution process and apply risk-reducing measures to improve patient safety of parenteral therapy.